Author Vincent O'Malley presents King Tuheitia with the first official copy of The Great War for New Zealand. Image courtesy Waahi Paa (Bridget Williams Books / Rhys Palmer). The first single-volume history of the Waikato War since 1879 was presented to King Tuheitia at the Waahi Poukai, Saturday 8 October. 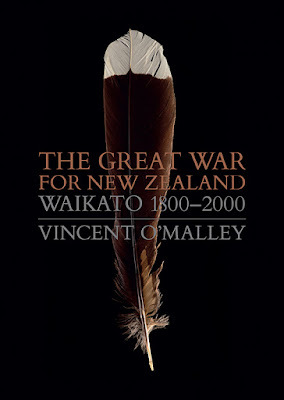 The Great War for New Zealand by Vincent O’Malley is already being hailed as a landmark book for all New Zealanders on publication. As Rahui Papa, Chairman, Te Arataura, Waikato-Tainui observes: ‘Vincent O’Malley’s work … shines a spotlight on a dark period of our collective past and brings it into a modern conversation for the consideration of New Zealand’s future’. Detailed, prodigiously researched and highly readable, it brings into the light the most brutal and influential conflict in Aotearoa New Zealand’s history. A monumental account of the war in the Waikato in 1863–64, the book traverses 200 years to trace both the conflict’s origins and its aftermath: from first encounters between Māori and Pākehā in the Waikato region in the early nineteenth century through to settlement and apology in the late twentieth century. Author Vincent O'Malley addresses the Waahi Poukai, Saturday 8 October. Image courtesy Waahi Paa (Bridget Williams Books / Rhys Palmer). O’Malley, a leading historian, argues with good cause that the Waikato War, rather than Gallipoli or the Western Front, is the defining conflict in our history. The Great War for New Zealand lays out how the war set back Māori and Pākehā relations by several generations and allowed the colonial government of the day to begin to assert the kind of real control over the country that had eluded it since 1840. O’Malley spoke at the book’s launch at the Poukai, Saturday 8 October. ‘It is a history that many Pākehā have preferred to ignore over the years, while you have never forgotten,’ he told the gathering of about 400 people. ‘But it is time as a nation that we remember. Me maumahara tātou – we must remember.’ O’Malley said it was time New Zealanders learned about this history that Tainui and other iwi have carried alone for so many generations. Author Vincent O'Malley signs books at the Waahi Poukai with (l-r) Mihirawhiti Searancke, Ratau Turner (holding book) and Pawa Raihe. Image courtesy Waahi Paa (Bridget Williams Books / Rhys Palmer). When: Wednesday 19 October 2016, 5.45 for 6 p.m.
Join us to mark a significant new publication on the Waikato War with Waikato-Tainui representatives Tom Roa and Rahui Papa and author Vincent O’Malley. Mihi whakatau begins at 6 p.m. Refreshments will be served after the speeches. All are welcome; no RSVP required. Tom Roa (Puurekireki Marae) is Negotiator for Te Arataura, Waikato-Tainui, and a lecturer in Māori and Indigenous Studies at the University of Waikato. Rahui Papa (Poohara Marae) is Chairman for Te Arataura, Waikato-Tainui, and currently co-chairs the Ngaati Koroki-Kahukura Tribal Trust. Vincent O’Malley is a founding partner of HistoryWorks, and the author of a number of books on New Zealand history. Spanning nearly two centuries from first contact through to settlement and apology, The Great War for New Zealand focuses on the human impact of the Waikato War, its origins and aftermath. The book arrives as the Government announces a national day of commemoration for the land wars and key sites are returned to iwi.